Earlier this week, Greg Clark, the new leader of the Alberta Party, tweeted at #abpse commentators asking him questions about his party’s views on Advanced Education, “I can see why Lukaszuk is afraid of you guys.” There is no evidence that the Minister of Enterprise and Advanced Education Thomas Lukaszuk feels any concern whatsoever about the commentary on Twitter’s #abpse feed. But this image, tweeted earlier this week in the lead-up to today’s rally at Mount Royal University in Calgary, shows one artist pitting art against the Government of Alberta’s March 7th cuts. 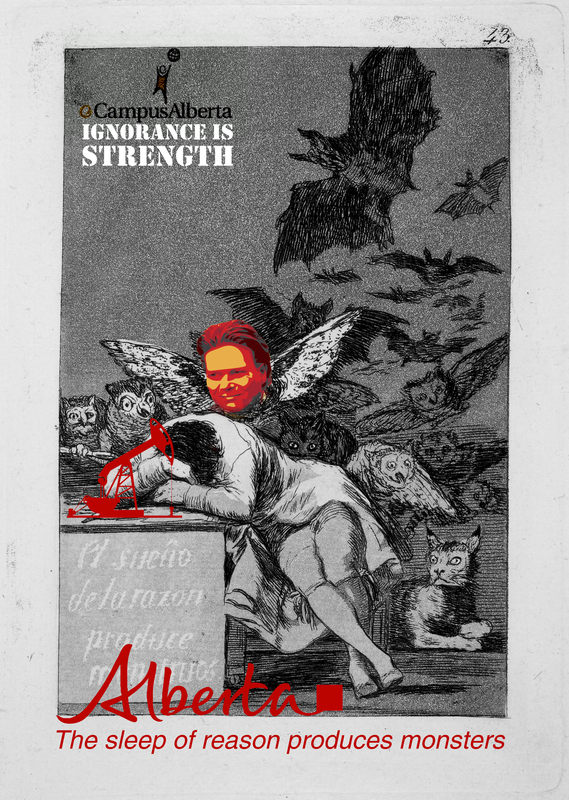 It is fitting that the response from an institution whose Arts programs have been so severely cut as a result of the Government of Alberta’s 2013 budget should come in the form of a reworking of the already satiric late eighteenth-century print “The Sleep of Reason” by Spanish painter and printmaker Francisco de Goya. The Minister might want to start paying attention to the perspectives driving such a response. This entry was posted in Uncategorized and tagged #abpse, goya sleep of reason, greg clark alberta party, mount royal university rally, thomas lukaszuk alberta. Bookmark the permalink. Herbert Marcuse and Mary Shelley are two of the thinkers most relevant to our times. Unfortunately Thomas Lukaszuk is not asleep, he’s simply too dense to understand the travesty he’s unleashed. Appalling behavior by a government that labelled itself as progressive and the only alternative to the “regressive” Wildrose. We read today that AASUA President, Kevin Kane, has met with The University’s President, and that Dr. Samarasekera has again expressed a desire to re-open the contract that we have already signed. Specifically, she wants back the 1.65 % increase we will receive for 2014. (I am not even sure if 1.65% keeps up with the cost of living. I would suggest that we need to see virtually everything, and in particular, we would want to look very closely at the relationship between the “structural deficit” and the increase in administrative positions and staff that have proliferated at Central over the last ten years. The fact that Minister Lukaszuk can take away and then return the same amount of money to a different project simply proves that the whole budget shortfall due to a “bitumen bubble” was simply not true. Hardly a surprise. We do, as “taxpayers” already pay for advanced, PUBLIC education services; now we must pay again — and be damn glad about it too, it seems — by returning portions of our salaries. We the faculty are nearly always “the problem,” and outside experts nearly always the solution. Odd, isn’t it, that faculty have for many decades contributed in their various ways to the $300+ billion dollar revenue generation which, apparently, our alumni have collectively contributed back to the Province (NOT the PCs)? And yet, we are always “the problem.” And we are certainly never “expert” enough to be able to have a true place in the re-shaping of public policy on education or even on the shaping of this university.